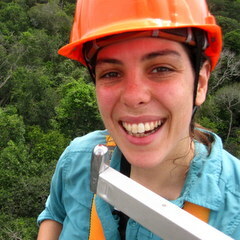 I’m a tropical ecosystem ecologist and postdoctoral researcher in the Dept. of Environmental Science, Policy, and Management (ESPM) at the University of California, Berkeley; I am a member of the Silver Lab. My primary areas of interest are the effects of global change on ecosystem processes (carbon, nitrogen and phosphorus cycling), feedbacks between land-use change and tropical forests, and using ecosystem services approaches in decision making. For more details (and a publication list), see my CV. Currently, I am working in El Yunque National Forest and asking questions about the drivers, global change and otherwise, of belowground nutrient cycling and greenhouse gas emissions across a topographic gradient. We use a combination of field-based data collection, laboratory experiments, and statistical modeling approaches. How do redox conditions and O2 availability vary across a tropical forest landscape? How do O2 dynamics relate to greenhouse gas fluxes and nutrient cycling? How might drought events and a warming world impact these tropical processes? My dissertation uses large, geospatial datasets in combination with ecological field studies and scaling-up techniques to ask questions about the ecological effects of agriculture in Amazonia. What are the ecological tradeoffs (to the carbon cycle, the energy cycle and habitat quality) of an increasingly agricultural Amazonia? How do those tradeoffs vary across space? What changes to the nitrogen cycle are associated with the intensification of Amazonian agriculture? How do emissions of nitrous oxide change with cropland intensification? How does nitrogen leaching change between Amazon forest and intensified cropland? How do changes to the nitrogen cycle influence landscape-level greenhouse gas emissions when land-use patterns are taken into account? Using an ecosystem services framework, what land-use patterns increase agricultural production in Amazonia at least harm to the earth system? My side projects tend to revolve around agricultural tradeoffs, tropical ecosystem ecology, ecosystem services writ large, methods of achieving sustainability, or some combination therein. And of course, I’m always, always, always excited to hear about new ideas and to chat about new (to me) questions!